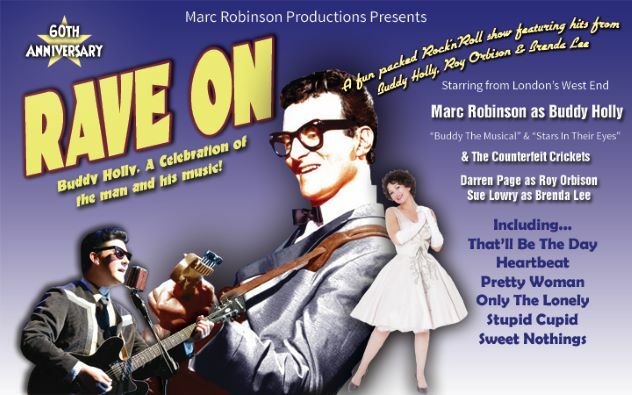 2019 is the 60th Anniversary since losing Buddy Holly - Marc Robinson will celebrate the man & his music with all the well known songs he left behind from .. Heartbeat, Peggy Sue, Raining in my Heart & It Doesn't Matter Anymore to name but a few! Marc Robinson from 'Stars in their Eyes', 'Buddy' The Musical and founder member of many shows around great Britain will bring back all the memories of days gone by a two hour foot tapping nostalgic show! To celebrate Marc Robinson has brought along a couple of guests to help the evening be a fun packed show! Darren Page as Roy Orbison & Sue Lowry as Brenda Lee.